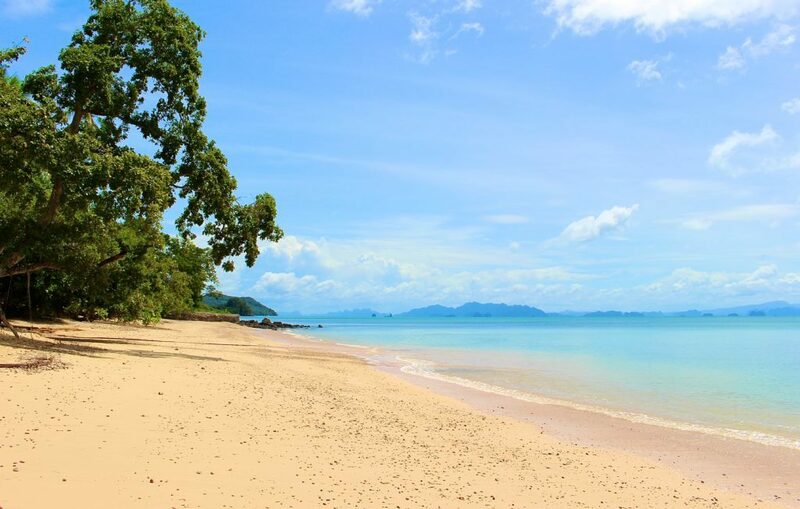 Do you ever have those days where you wake up and think, “I would do anything right now, to be on a sunny island in Thailand, with a big, spicy bowl of curry in front of my face”? Inconveniently, though, I’m over here in California. And no matter how much I want it to be, going to Thailand just isn’t on the agenda today. So instead of pouting, I’ve decided to bring Thailand to me. Today, I’m cooking up a big ol’ pot of Thailand, in the form of some creamy yellow curry, packed with tender chicken, potatoes, carrots, and onions. I know I can hardly wait to share my Thai yellow curry recipe with you. So let me ask you one thing. This Thai yellow curry recipe couldn’t be easier to make, and it couldn’t be more satisfying either. It’s one spicy, creamy, flavorful trip to Thailand, packed into one bowl. And it’s healthy, too! Serve this curry over some rice, and garnish with a pinch of cilantro, and you’ll transport yourself to a faraway land — the Land of Smiles — where the sun is hot, the curry is even hotter, the Asian elephants roam, and the beaches are nothing short of screensaver material. To make this Thai yellow curry recipe properly and authentically, you need one very important ingredient: Mae Anong Karee Curry Paste. If you search high and low, you might be able to find yellow curry paste at the grocery store. But if you want your curry to taste just like the curry you’ve had in Thailand — or at your favorite Thai restaurant — you need this curry paste, which is imported straight from Bangkok. 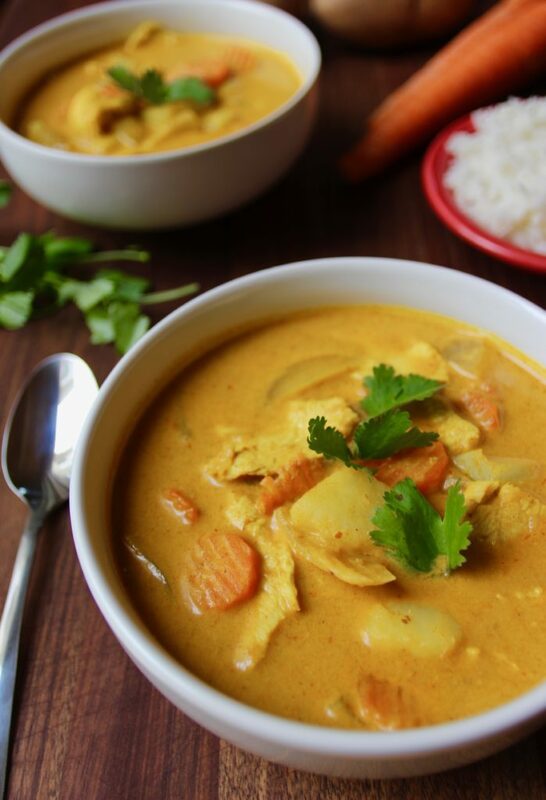 The hardest part about this Thai yellow curry recipe is simply waiting for the mailman to deliver your beautiful parcel of curry paste. Once you have it, all you need to do is thinly slice your chicken, chop up your vegetables, and let the curry paste work its magic. And of course, you can’t forget to throw in some of that thick and luscious coconut milk. Mmmmm. Yes, please. A staycation never looked so good. Am I right? Seriously, this stuff is the real deal. Making this Thai yellow curry recipe is like taking a trip to Thailand, but without the jet lag and the expensive plane ticket. It’s creamy, spicy, and healthy, and it’s everything you’ve been needing in your life. And if you don’t have all the ingredients, don’t worry! This recipe is very versatile, so you can add in whatever vegetables and proteins you have on hand. 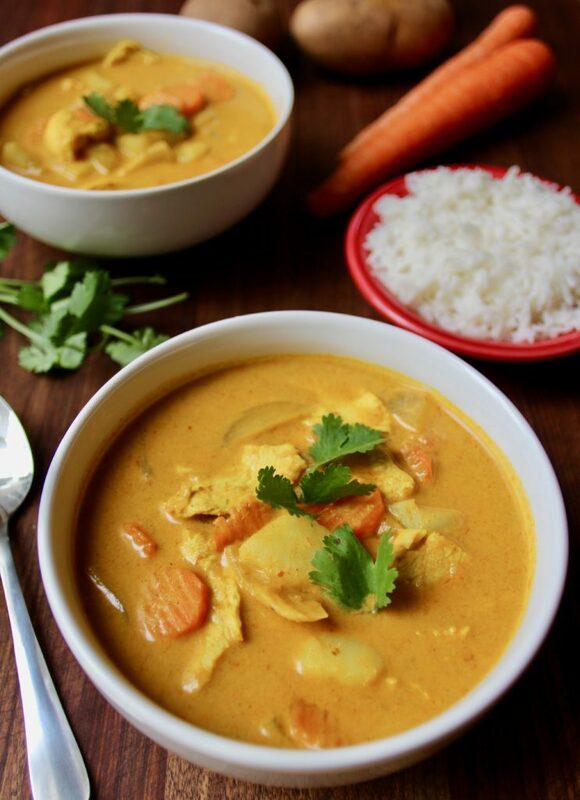 This Thai yellow curry is authentic and absolutely delicious. And now that you’ve seen this post, you know you want to make it! So what are you waiting for?! 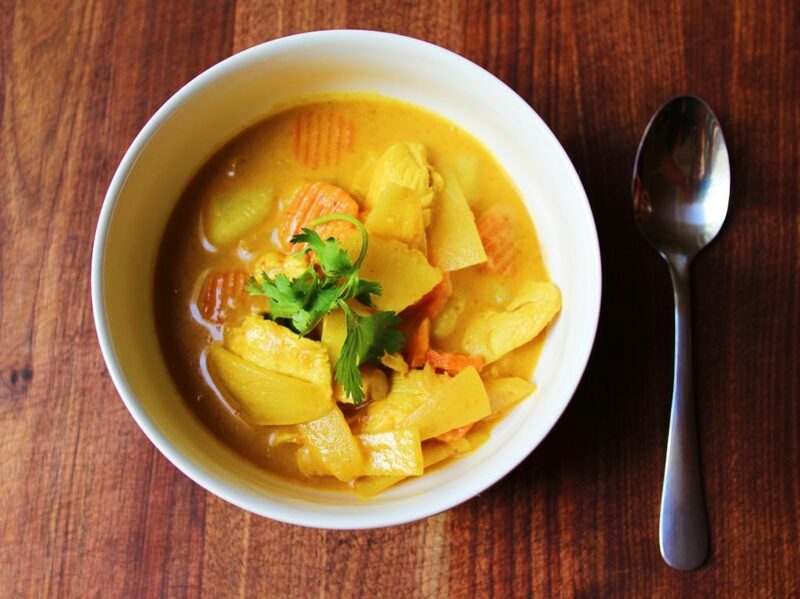 Craving some authentic Thai yellow curry? Don't have the time to take an island vacation? Well, this simple, spicy, and delicious recipe will take your tastebuds on a journey to Thailand, and you don't even have to leave your own kitchen. Bring a pot of salted water to a boil, and boil potatoes until fork-tender. Drain and set aside. Then, in a large pot, heat up coconut oil. Add curry paste to oil, and stir for a few minutes. Add in coconut milk and chicken stock, and stir. Bring to a boil. Once carrots are almost fork-tender, add in very thinly sliced chicken and cook for two or three minutes. Then remove from heat. Stir in fish sauce, salt, and sugar. If desired, serve over rice and garnish with cilantro. Make sure to purchase this yellow curry paste from Amazon. While you might be able to find other yellow curry pastes at the grocery store, none of them are as authentic as this one, which comes straight from Thailand! If you don't have virgin coconut oil, you can also use vegetable oil. You can make this recipe vegetarian/vegan by simply omitting the chicken and fish sauce. Just make sure to salt the curry accordingly. We used this mandoline, to cut all of the carrots equally, and to give them that fun, ridged texture. 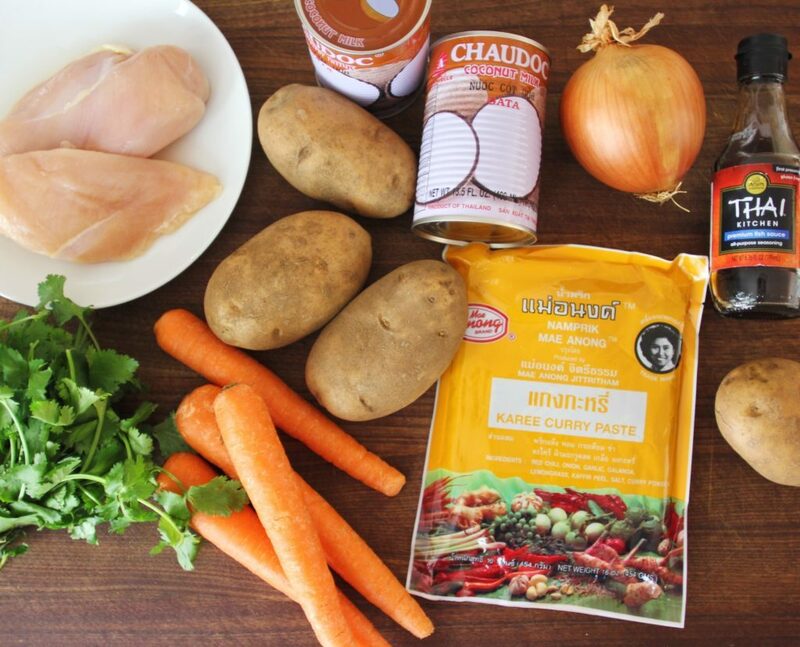 Did you try making our Thai yellow curry recipe? Let us know how it went by commenting below and tagging @travelalphas or #travelalphas on Instagram! YUM! I just made curry last week. Mine is really similar–just add veggies, coconut milk, and curry paste (I prefer red). It’s one of those ridiculously easy meals I forget about, and then when I finally make it again I kick myself for not making it more! You can do it that way if you choose to. However, this recipe first calls for cooking your curry paste in coconut oil, which should give you that same rich curry flavor you’re looking for. So if you have coconut oil on hand, follow this recipe and then you will add the coconut milk in at a later step. If not, you should break the coconut milk. What does it mean…to break the coconut milk? How many servings do you get from this recipe? I’m looking to serve it to 4 adults for dinner. Take your raw chicken and thinly slice it. Then you’ll add it to the curry toward the end of the process (see the directions) and it’ll cook in there – it should only take a few minutes. Enjoy! Hi! Can I use curry powder if I don’t have the paste? You technically could…but I would not recommend it. You won’t get the same result. Curry powders are often Indian, while pastes are usually Thai, so they have completely different flavor profiles. See our Indian curry recipe (it’s my absolute favorite) if you prefer to use your curry powder! I suspect it could have been your coconut milk. Some brands are much runnier than others. If possible, try making it with this coconut milk brand next time. Then make sure to cook down the curry to the thickness and consistency you want before you add in the vegetables and chicken. And if all else fails, you can always use corn starch to thicken… However, keep in mind that Thai curries should not be very thick. I used coconut cream instead of milk and cooked the potatoes in the sauce. It was thicker than with coconut milk. I have recently fell in love with Thai yellow curry so I am excited to try this. Question though, is the fish sauce absolutely necessary? I hate fish and worry that by adding the fish sauce it will give the fish a fish taste. Will it still come out delicious if I omit it? I am just waiting for my amazon package to arrive so I can make this delicious looking recipe! I have one question- it never fails that I mess up any recipes using coconut milk. Whenever I open a can it always has solid substance at the bottom and liquid at the top. So, do I open the can and only use the liquidy stuff? Do I use the solid stuff only? Or do I shake the Can and mix it all together and just use it all? My first attempt at any curry and this recipie is just wonderful as is, which makes me very happy! My Husband told me he wasn’t very hungry for dinner and then proceeded to eat a big bowl of it and proclaim I can make it again! Thank you! The flavor of this was pretty good, but I had a few observations. -I always prefer recipes that give me the actual weights of vegetables in addition to the number of vegetables. This makes it easier to scale recipes based on what I have or to make substitutions. I used baby potatoes sliced in half rather than Yukons. -I like recipes that give me approximate times for various steps. This helps me coordinate preparation of multiple dishes or gives me an idea of the time I’ve got to do something else. In particular, it would be good to have an approximate cooking time for the carrot slices. -I tried using my mandoline to make wavy carrot slices, and found it to be a potentially dangerous endeavor. I couldn’t use the hand guard to slice the carrots end on, but rather had to do each one by hand, taking great care to avoid the blade. On my mandoline, 1/8th inch slices were hard to do. Further, the 1/8th inch slices overcooked slightly. Next time I’ll make them thicker. -I agree with other posters that cooking the potatoes in the same pot with the sauce would have been simpler. It took about 4 minutes for the carrot slices to become tender followed by 3 minutes for chicken, so…I would have added the potatoes, cooked for about 3 or 4 minutes, and then added the carrots, onion and chicken. -I found the sauce to be a little thin and the curry a bit strong. My personal preference would be to cut down on both. My first time making curry, it was good! I added a few more veggies and some bamboo shoots. I would probably cut back on adding 2 cans of coconut milk would probably use just 1 can and a half. I’m glad I found there’re people love making authentic Thai yellow curry. It looks so good with a variety of vegetables in it. Also, using fish sauce is the key! Try to make the coconut milk “cracked,” and you will experience a smooth texture of it. Made this tonight, followed the recipe exactly. I wouldn’t change a single thing. It was so very good! Loved it! Better than my favorite local Thai food place! I live in the UK and can not buy your yellow curry paste. Can you suggest an substitute brand please. Could garlic and ginger be added? Definitely. I believe that those ingredients are already in the paste, but if you wanted to add more, you could. I live in the UK. Love this recipe, I am a terrible cook but my favourite Thai Restaurant changed owners and the food is not the same so I thought I would try to make it myself and this recipe was so easy to follow and it tastes great. I went down to our local oriental supermarket but the didn’t have the paste you used but they suggested the Mae Ploy Yellow curry paste instead which I used. I am making another batch this afternoon but will try half coconut milk and half cream as it was a bit too runny with 2 x milk for me. I want to make the sauce to take to a friend. Would go ahead and add the fish sauce step to the curry and then bottle it? She’d heat up her own veggies and poor it over. Would it ruin the flavor?